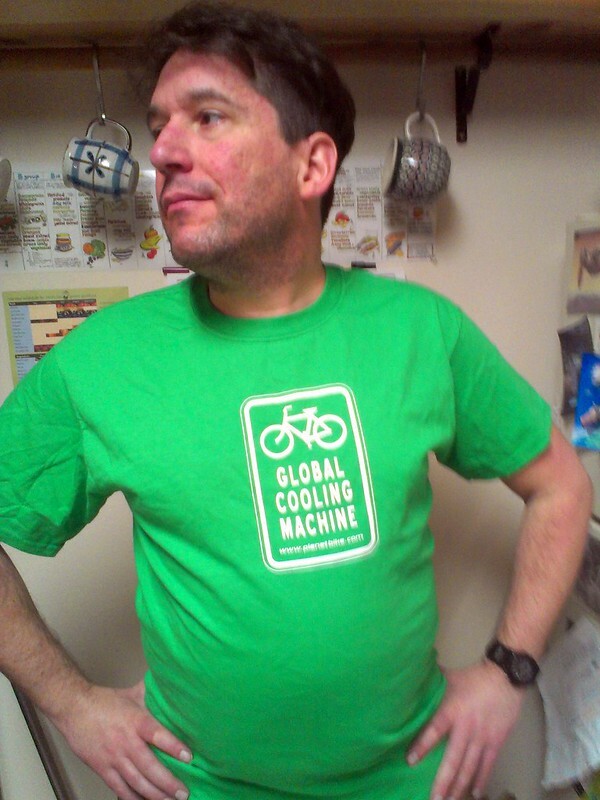 Urban Adventure League: I went to Bike Trivia, and all I got was this T-Shirt. I went to Bike Trivia, and all I got was this T-Shirt. My Thursday was pretty open. It was my first day off after six straight days of work, and I had no real obligations. If I had the energy, I could have gone on a pretty good bike ride, but honestly, lethargy occupied most of my day. Until night rolled around. 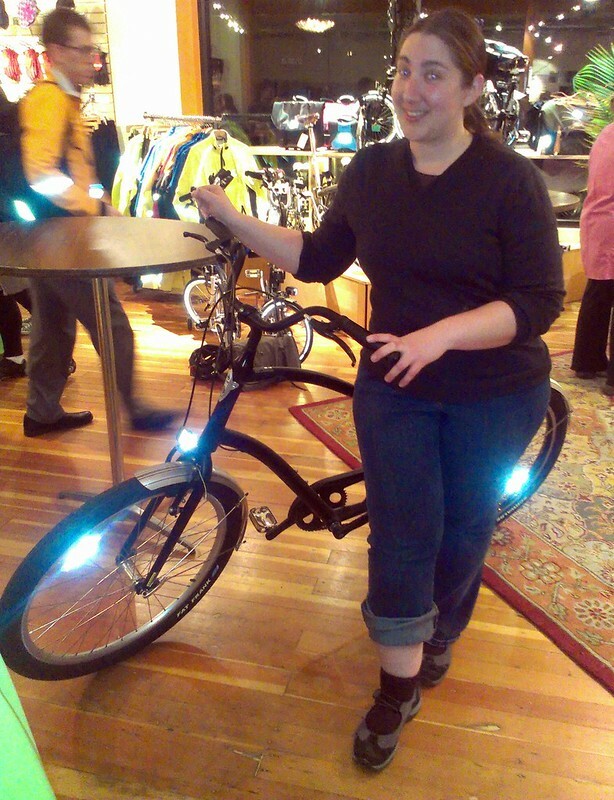 This is when April asked if I was going to go to the "Bike Trivia Night" at Clever Cycles. I hadn't thought about it until then, but I was game, so we met up at Portland's family/cargo/practical bike shop around 6pm. This was probably the first Sam Adams I've imbibed since the East Coast. 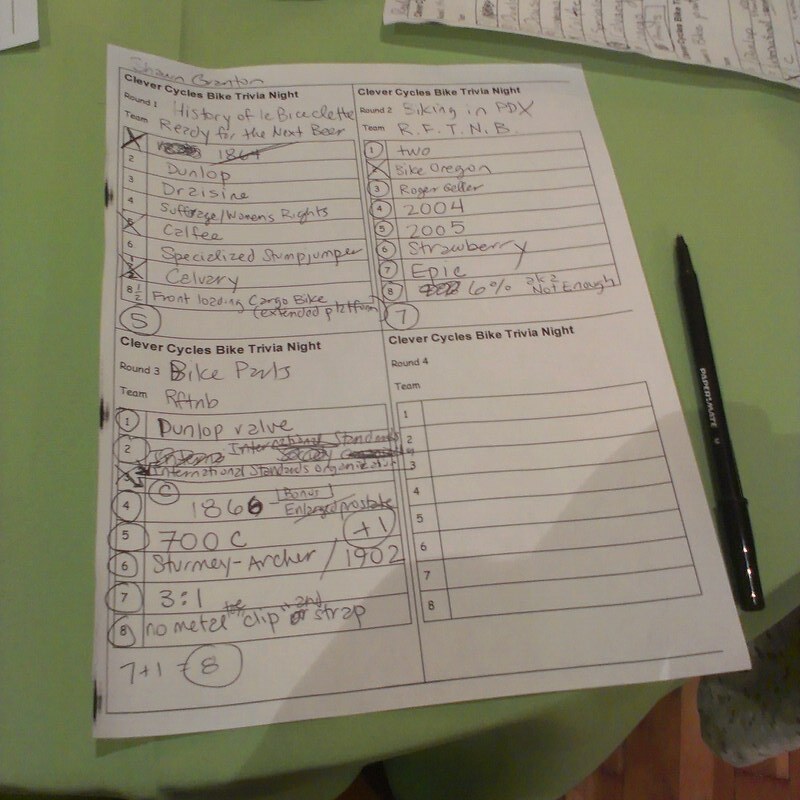 We didn't really know what to expect from "bike trivia" and were a bit worried by the questions, and intimidated by one other team that had an employee of Chris King. But never fear. For this bike trivia was put on by a bike shop renowned for transportation cycling with heavy Euro/Retro-Grouch tendencies. We were golden. I mean, what other bike trivia would have a question like "What's another name for a Woods Valve?" (The answer: Dunlop valve, which I got right.) Or, "What was the maker of the first commercially available three speed hub?" (Duh!) 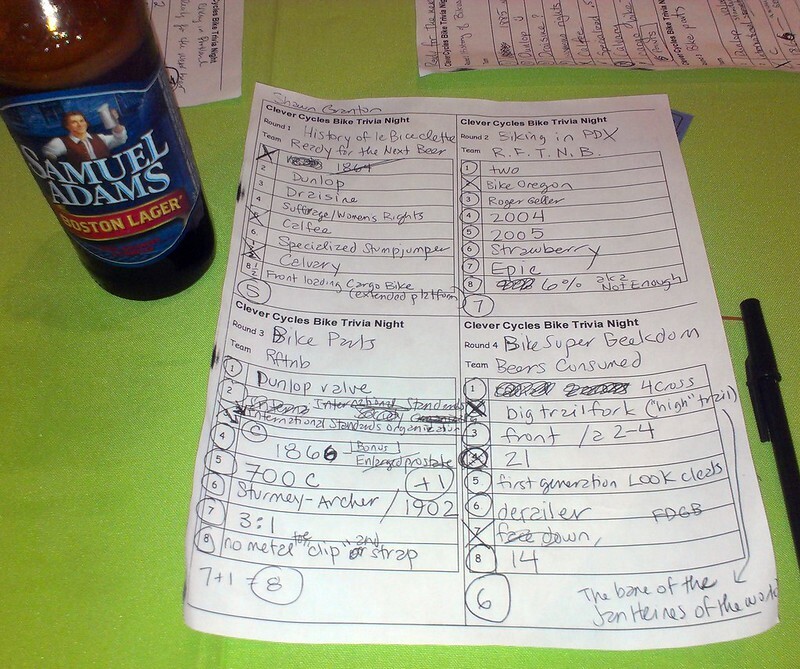 The bike-specific trivia was pretty well geared to anyone who spends a considerable amount of time on Sheldon Brown. The first three rounds the members of our team won, which meant Kristi and I ended up with a t-shirt and April a water bottle. At this point the dude from Chris King wasn't happy. After four rounds and many beers, the trivia night was over, with our "team" getting top honors. 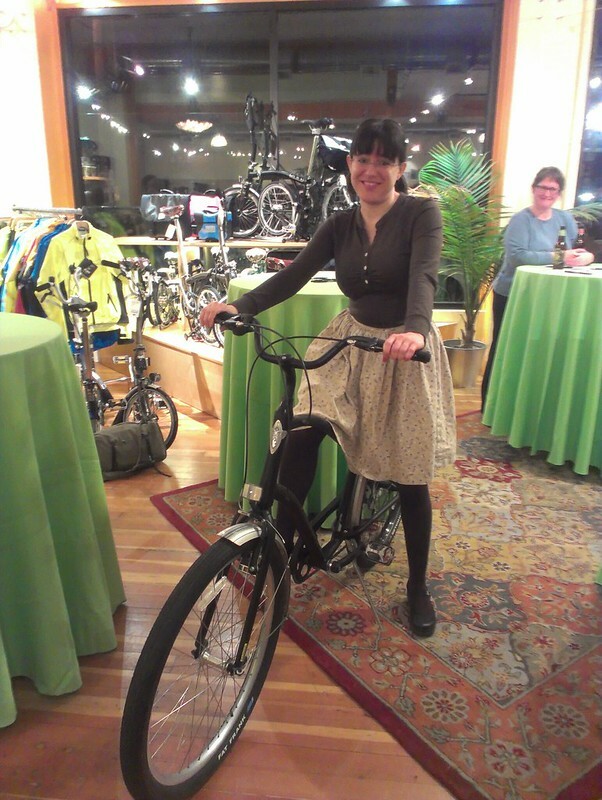 It was a bunch of fun, and I was amazed how much I knew about obscure little bike stuff. Hopefully they'll have it again! Tell me more about Clever Cycles. Is it a shop that you normally frequent?